Forty-three year old German driver Leo Löwenstein lost his life in an accident during yesterday’s VLN race. The incident took place on lap 22 after Löwenstein’s Aston Martin Vantage GT4 collided with two other cars forcing his car into the air. The car over turned and hit the arcmo at the Bergwerk section of the track and caught fire. Emergency crews arrived quickly at the scene but were unable to revive Löwenstein. The race was red-flagged after the incident and as a mark of respect for the driver the race did not restart. Our thoughts are with the Löwenstein family, as well as competitors and officials of the VLN series. UPDATE 29 April: An official statement from Aston Martin is available below. 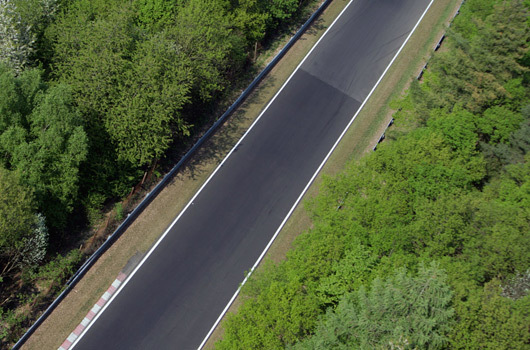 On lap 22 of the ADAC-ACAS-H&R Cup Race at the Nürburgring on Saturday 24 April an accident occurred resulting in the tragic death of experienced driver 43-year-old (Leo) Carl Friedrich Prinz zu Loewenstein, driver of a Vantage N24. According to the report of the race organisers, at the Bergwerk section of the circuit the car was caught between two other competing cars causing the Vantage N24 to roll over at high speed and make heavy contact with a crash barrier and the FIA safety fence. The high speed impact with the safety fence caused massive damage to the rear of the car. Although the resulting fire was contained to the rear sadly Mr Loewenstein died of smoke inhalation. As with any racing fatality the accident is currently under official investigation which Aston Martin supports fully. Each Aston Martin racing car, including the car that was involved in the accident on Saturday, fully complies with the stringent safety regulations of the FIA. “We are deeply saddened about this accident. Our thoughts and deepest sympathies are with Leo’s wife, children and family at this time”, said Aston Martin Chief Executive, Dr Ulrich Bez. Always sad to hear of a death in the motorsport well. My thoughts go to the families and friends of all involved. RIP Mr Löwenstein. Our thoughts and prayers are with you and your family.